The different cameras, mics, lights. laptops, hardrives… they all make it into the car and we head off in the late morning for the three-hour trip. Alicia tells us that she doesn’t plan anything else the days she travels to Simojovel. I think I might be a bit much but, anyhow, she’s been there plenty of times before so I agree. It takes us far too long to cross small San Cristobal due to the bumper to bumper situation; on the outskirts we do a pitstop to fill on fuel and some food for our stay. Shortly after that, we start going up and up and around a bend every hundred metres, and now I understand what she’s talking about. I’m at the back, taking photos, chatting, being all jumpy but, less than an hour into the trip I’m concentrating hard on not getting sick. 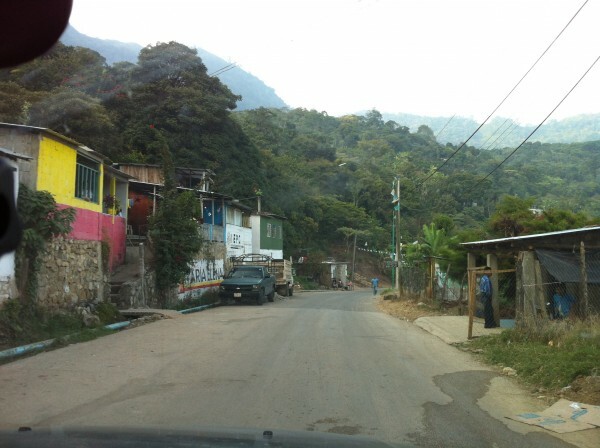 The first part of the trip is a familiar route, up past the village of Chamula, which is one of the two stops included in ventures out of San Cristobal for visitors: “the indigenous villages of Chamula and Zinacantán”. The first time I visited back in the moody teenage years my dad had to do a lot of sweet talking with the authorities of the town to avoid being put in a cell because we had stopped the car in front of the town hall. The Chamulas are closed off, proud and hard; if you want to visit, you follow their rules, and fair enough too. Another way you can get yourself into their cells is by taking pictures inside their famous church, which is one of the most colourful representations of Mayan-Catholicism, a symbiosis of Catholic and their own old and modern religious practices. The church is lined by the familiar painted and sculpted representations of the Virgin, Christ and different saints, but adorned in Chamula clothes and ornaments and their significance radically reinterpreted: I remember a sculpture of Christ tied to a low column and leaning over it slightly; we happened to ask what it represented, “Jesus drunk” came the prompt reply. Well, the conquest introduced alcohol to the Mayans and now is intricately linked to Catholic celebrations; when men here drink, they’ll do it for days in a row and are unable to do anything else. No wonder their women are much happier when they all convert to one of the many pentecostal churches that abound through Chiapas. On the ground of the Chamula church, there are no benches, the floor is covered in fresh grass and small candles that each faithful sticks to the ground and lights when they come to pray, which they do using a combination of fresh eggs, live chickens and soda -it used to be liquor- and bundles of herbs that they hit whoever is getting blessed with, after spitting soda on them and passing a chicken around their heads. 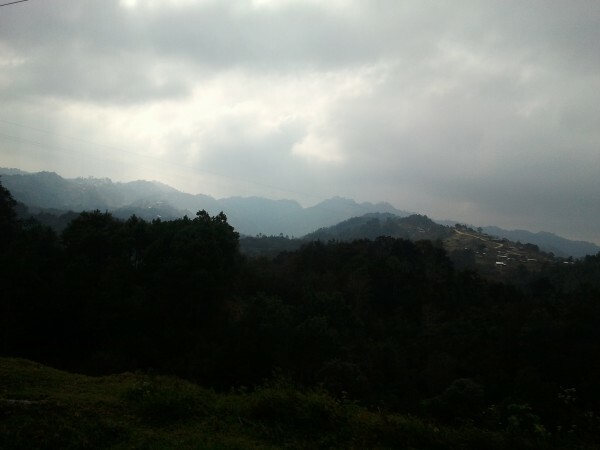 We continue up the Altos, the Highlands of Chiapas, past the Zapatista stronghold of Oventic and right through to San Andres Larrainzar, places that we had got to know in the previous projects. Ah, the Altos, mist and green mountains, cool air, the smell of fires and plenty of indigenous dressed in traditional clothes. I love it, can we stay here and make a documentary about the non-mining indigenous of the Altos? No? ok then, we’ll go to the heat. 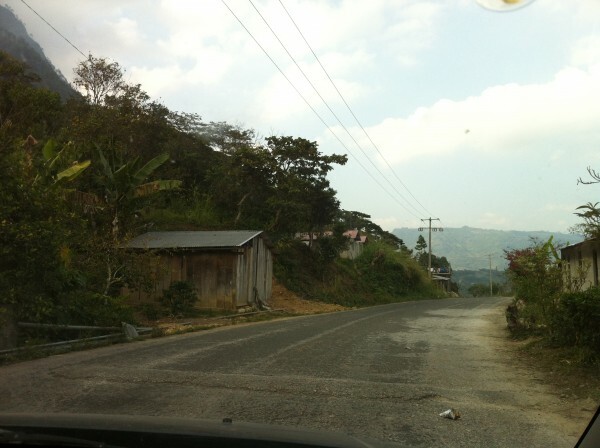 The thing about this trip is that we have to do a huge loop to get to Simojovel, we have to go up and around the whole of the Altos region to come back down again; it’s much closer to Palenque but there’s no road from there… this reminds me of the bus routes in Dublin. Bend after bend after bend, we start to see the vegetation change, banana trees pop up on the side of the road and the road is no more in lots of places, unpaved or broken old asphalt that Alicia masterly and quickly manoeuvres, while I concentrate on not throwing up everything up to my first baby puree. I will certainly not be up for much when we get there. 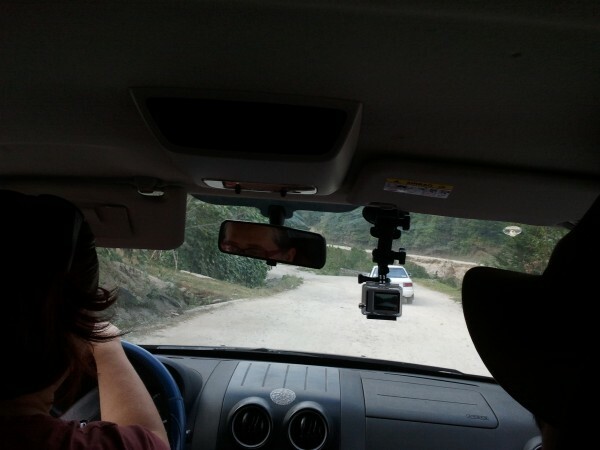 Driving cross-country GoPro in tow.